Olson is a graduate of Dallas Theological Seminary and holds a doctorate in Missiology from Trinity International University. This 2005 edition is “an abridged and revised edition of Beyond Calvinism and Arminianism,” 2002. 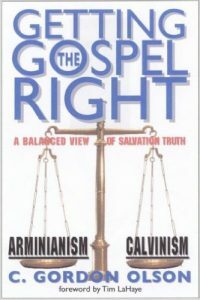 Olson takes on the age-old controversy over Calvinism and Arminianism from a view very similar to Norman Geisler. It is recommended by several well-known teachers and writers including Paige Patterson, Earl Radmacher, James Bjornstad, and Tim LaHaye. Since I am generally in this camp I can identify a lot with Olson’s points. He believes in an unlimited atonement and denies irresistible grace. He places foreknowledge before election in the ordo salutis, or order of God’s salvation decrees. He holds that, “Faith is not in any way meritorious or to be thought of as a work,” and that, “calling is mediate through the Word of God, but that regeneration itself is immediately and diretly, one hundred percent the work of the Spirit” (p. 220).